Barry Humphries will play the Goblin King, Evangeline Lilly a Woodland Elf named Tauriel. The latter doesn't appear in the book. Luke Evans cast as Bard, Benedict Cumberbatch voices Smaug. Orlando Bloom is in again as Legolas and the titles for the movies are revealed: THE HOBBIT: AN UNEXPECTED JOURNEY and THE HOBBIT: THERE AND BACK AGAIN. The Master of Laketown and Azog have been cast. Stephen Fry will be playing The Master of Laketown, Conan Stevens will be Azog. Fili and Thranduil have been cast. Rob Kazinsky had to step back from the role of Fili due to personal reasons. Now Dean O'Gorman will be Fili. Thranduil, the king of the Wool-elves, will be played by Lee Pace. First video from Peter Jackson from the Hobbit set. Christopher Lee joins the team. The 88 year old actor will reprise his role as Saruman, providing he is in good health. Besides, a rumor says that David Tennant will be Thranduil, the king of the Wood-elves and father of Legolas. As in Lord of the Rings: Ian McKellen is Gandalf, Andy Serkis is the model for the computer-animated Gollum. Elijah Wood (Frodo) will be in The Hobbit. He will feature in the opening sequence. Cate Blanchett will be Galadriel again. Also cast are Ken Stott as Balin, Sylvester McCoy as Radagast, Mikael Persbrandt as Beorn, Ryan Gage as Drogo, Jed Brophy as Nori and William Kircher as Bifur. James Nesbitt is Bofur, Adam Brown is Ori. This was announced yesterday by New Line, Warner and MGM. The Hobbit has green light, MGM, Warner Brothers, and New Line have confirmed. Peter Jackson is reconfirmed as director. Peter Jackson will direct The Hobbit. The director of the Lord of the Rings movies, Peter Jackson, originally was the producer of The Hobbit. After the retreat of Guillermo del Toro, Jackson takes his position. There are still 2 movies planned, which are loosely scheduled for 2012 and 2013. Director del Toro drops out of The Hobbit! The Hobbit doesn't have a director any more. Due to the ongoing delays, Guillermo del Toro decided to step back as director from The Hobbit. His original commitment was for three years, he couldn't life for six years in New Zealand, Peter Jackson said about del Toro's retreat. Del Toro will continue to co-write the screenplays. In an agreement between Warner and Imax, Warner seems to plan with December 2012 for the Hobbit release. The movie shall be in 3D at least for Imax cinemas. Peter Jackson adjusts some things concerning timeline and casting. The second script (first draft) is finished. Jackson supposes, that this autumn shooting will begin, but MGM has to give green light first. No actors have been signed yet, but the ones from LotR with roles also in The Hobbit are wanted there, of course. According to Ian McKellen (Gandalf), the shooting for The Hobbit starts in July, casting has already begun. The Irish twins John and Edward Grimes will audition for the roles of Fili and Kili. At least those are the latest rumors. Seems like there won't be a delay and that the casting has begun. The filming was pushed back from spring to some time in the summer, there is no green light yet, according to Peter Jackson. The script for the first movie is completed and was received well by the film studio. Gandalf's adventures apart from Thorin & Co, which probably above all means those at Dol Guldur, will feature in the movies. John Rhys-Davies, Gimli in Lord of the Rings, won't appear in The Hobbit as Gloin. Here are pictures from the current Hobbiton set, made in August. The lawsuit between Tolkien Trust, New Line and HarperCollins is settled. It was about the earnings from the Lord of the Rings movies. After this settlement, there shouldn't be any more juristic obstacles for the Hobbit film adaption. Screenplay for first Hobbit film is finished. Peter Jackson finished the writing this month. Hobbiton is re-build for The Hobbit. The construction work on the Hobbtion set from the Lord of the Rings has begun. Hugo Weaving, Elrond in Lord of the Rings, is confirmed by Del Toro to be cast in the upcoming Hobbit films. While is was not specifically said that he will be Elrond, it is obviously for sure that he will play this role again. Filming will start in March 2010. The movies will include something about the history of Erebor, Jackson and Del Toro told in an interview in the print issue of Empire magazine. Beorn and the spiders of Mirkwood will appear. 3D is still an option, but there are concerns about it if it would catch the feelings of the trilogy. Del Toro won't try to imitate Jackson's style. The story of The Hobbit will span over two movies, producer Jackson and director Del Toro told. The White Council and the comings and goings of Gandalf to Dol Guldur will be interlaced. The idea of having a bridge movie about the time between Hobbit and Lord of the Rings as part two seems to be dead. Ralph Moeller said, a role in the Hobbit was offered to him. He was asked to play a wolfman, but he hasn't been signed yet. Such a creature doesn't exist in the Hobbit. Maybe an Ork or Beorn was meant. Mike Mignola, artist for some of Del Toro's movies, will work on visualization together with Weta, Alan Lee and John Howe. A good third of that is already done. There are still a few actors possible as Bilbo, but no names are given. Del Toro said, filming will begin in 2010 and last for about 370 days. Maybe The Hobbit will be splitted in two, instead of making the second movie with materials from the appendices. Del Toro said in an interview, the Hobbit is "the hardest movie I'll probably ever do". He wants the Dwarves to be believable and not as secondary characters. And Smaug "is the best Dragon ever written". According to Del Toro Peter Jackson probably won't film any scene of The Hobbit, all will be done by Del Toro himself. Meanwhile the script is almost finished. The writing for The Hobbit has begun. Del Toro clarifies, that there definitely will be two movies. Del Toro will write the screenplay for the first Hobbit movie. Jackson, Walsh and Boyens for the second movie, if there will be one. Then they plan to switch and rewrite each other. Del Toro says, it isn't sure that there will be a second Hobbit movie. "We believe there is a second movie. If there isn't, there will not be." James McAvoy says he won't be Bilbo. The momentarily circulating announcement, that James McAvoy will have the role as Bilbo, is only an unconfirmed rumor so far. Ian Holm won't play the leading part as Bilbo in The Hobbit, but should have some other small role (maybe older Bilbo in a flashback). Several actors are considered for Bilbo, one of them is the first choice, but no names are given yet. A court will decide on 6th of June, if the production of The Hobbit can continue or not. Christopher Tolkien is claiming, that New Line didn't pay a 7.5% share of profits that was signed in 1969, when J.R.R. Tolien sold the rights. Rumors tell of Liv Tyler (Arwen) and Viggo Mortensen (Aragorn) being on board again. For the second movie, the link between Hobbit and Lord of the Rings, this would be quite logically. Peter Jackson and Guillermo del Toro invite you to a live internet chat about The Hobbit on Saturday, 24. of May. Something happened in the last two weeks: Del Toro, McKellen and Serkis are in. Breaking news: Del Toro will direct The Hobbit. Der Toro said on April 19th, in the next four or five days we will know if the deal [between Warner and him] will happen or will not happen. Del Toro wrote in a Hellboy II forum about The Hobbit, that "there has been a lot of movement. And for the last few weeks there has been a lot of creative / cast / crew / visual talks and agreements and we have witnessed great progress in areas that I cannot disclose or that have already leaked from other sources". According to an interview with Ian McKellen, The Hobbit will be in cinemas in 2011 and 2012, one year later than previously announced. Del Toro says, things are moving forward. "But at the very least, I have the illusion of movement." Howard Shore, who composed the music for Lord of the Rings, will be composer for The Hobbit, too. Del Toro is still in negotiations about directing The Hobbit, he recently said. Time Warner has fusioned The Hobbit studio New Line with Warner Bros, making it one big company. Apparently the New Line bosses Robert Shaye and Michael Lynne won't be on board any more. Universal was stunned to hear about Del Toro as Hobbit director, because they want him for a Hellboy sequel and for Lovecraft's 'At the Mountains of Madness'. Universal production chef Donna Langley: "We're in discussions with how to rectify that with Guillermo". Del Toro wants the actors from Lord of the Rings, like Andy Serkis and Ian McKellen, in The Hobbit, too. The Tolkien Trust and HarperCollins are suing New Line, claiming the company failed to pay a cut of gross profits for the Lord of the Rings movies. This could cause another serious delay for The Hobbit. Let's hope it won't. Guillermo del Toro will direct The Hobbit, he said himself in an interview. Update: This is not official yet and may proove wrong, Del Toro admitted. Nothing is finalized yet in the director question, according to MarketSaw. Jackson did contact Del Toro and talked about "possibilities". Guillermo del Toro is in talks with New Line and MGM to direct The Hobbit. This rumor was denied by New Line! The contracts of Bob Shaye and Michael Lynne with Time Warner will expire this year. Rumors say they won't be renewed. Shaye and Lynne founded New Line, which now belongs to Time Warner, in 1967. According to Deadline Hollywood Daily it is 'virtually certain that the studio pair will be shown the door'. Elijah Wood wants to reappear in a minor role in the second movie as young Frodo. He confirms that this movie should fill the gap between Hobbit and Lord of the Rings. Christopher Lee hopes there will be a place for him in The Hobbit. Peter Jackson will play host to key insider people for a scale discussion on what 3D options to elect for The Hobbit, says Marketsaw. Here is a very good and detailed summary of the current Hobbit situation. Rumors tell of Hellboy-director Guillermo del Toro as a new candidate to direct The Hobbit. According to Entertainment Weekly, the first movie will deal with the book The Hobbit, whereas the second will link The Hobbit and The Lord of the Rings. I suspect, that then the second movie will use a lot of material from the appendices. The Hobbit movies will be made with Peter Jackson and Fran Walsh as producers! New Line and Jackson have reached agreement, the dispute between New Line boss Shaye and Jackson seems to be settled. Jackson and Walsh will produce two Hobbit movies, a director isn't named yet. Both movies will be shot simultaneously, like The Lord of the Rings movies were. Production will start in 2009, the movies are scheduled to come to our cinemas in 2010 and 2011. A new rumor by MarketSaw: Peter Jackson will surely make two Hobbit movies. The second movie will be influenced by The Silmarillion and the Unfinished Tales. The source of this rumor is claimed as 100% veracity. If this is true or not, time will tell. The latest rumor of Jackson doing The Hobbit in 3D was commented as 'not true' by New Line. New rumor says: Jackson will make The Hobbit in 3D. This claims a by own account reliable source. A blog on 3D movies has the story that two Hobbit movies will come 2010 and 2011, directed by Jackson and shot in 3D. Sam Raimi believes that Peter Jackson is in negotiations with New Line about The Hobbit. On top of each page is now displayed what happened on this day in The Hobbit. A new book, entitled The History of the Hobbit is available. Sam Raimi wants Peter Jackson to direct The Hobbit, but in case Jackson would only be the producer, Raimi would do it. Tolkien's nephew Tim Tolkien praises the progress in the legal row between New Line and Peter Jackson. Michael Lynne of New Line says, there is 'more than hope' for the Hobbit movie. But he didn't get precise. In an interview on New Line's 40th anniversary, Bob Shaye and Michael Lynne talk of the company's history and future and are also mentioning The Hobbit. Start at about minute 47.
which is a quite good summary. New Line has now accepted the fine and won't oppose it. Peter Jackson has won the first round in the legal battle with New Line over the payment for Lord of the Rings. New Line has to pay 125 000 US$ and Jackson's lawyers have been allowed to inspect New Line's files, if the studio did not produce several audits within 21 days. Aragorn (Viggo Mortensen that is) wants to be part of The Hobbit, too, but admits he is "not really in the loop." and it "doesn't seem like I would be part of". Q: Are you involved with "The Hobbit"? Article on NZ Listener, the Hobbit part is on end of page 2 and on page 3. In a video interview (at 1:54 minutes) Sam Raimi said that New Line is in negotiation on The Hobbit, more he couldn't say. On a comic con he said that "while he loved what Peter Jackson did with the franchise, he had no plans to follow it up". Ian McKellen did an interview basically about Singapore gay rights, but with one starement about the Hobbit, too. Q: A film version of Tolkien's "The Hobbit" has been stalled because of a dispute between "The Lord of the Rings" director Peter Jackson and film company New Line Cinema which holds the film rights to the book. Has there been any movement on the film development? A: "I detect that there is movement and it's movement in the right direction. I'll be seeing Peter (Jackson) when we tour (New Zealand) next month. I hope it will happen." Shaye is talking again about The Hobbit, not really saying anything. But that little nothing is interpreted by the New Nork Post as "hints we should never say never at the idea of Jackson". Article on New York Post, the Hobbit part is at the very end. 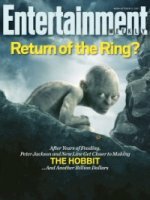 Although New Line says they won't yield to Peter Jackson, they want to settle their dispute: Article on Variety. This article is a good summary of the momentary Hobbit situation: Once more on New Line, Peter Jackson, and The Hobbit. 'We have a great many friends at New Line and utmost respect for the risk they took with us and it hurts to be hit with the level of venom directed at us from individuals in that company. It's been a lot more nasty behind the scenes than what's been made public. It's just an accounting dispute at the end of the day, but it makes you wonder what they have to hide.' According to Jackson, chances of him doing The Hobbit are 'remote at this point'. Orlando Bloom, Legolas in the Lord of the Rings movies, wants to be involved in The Hobbit with Peter Jackson. He is not sure, if he will under any other director. Though Legolas doesn't even appear in The Hobbit, he could be involved in a subplot. But hopefully The Hobbit movie will be more true to the book, than the Lord of the Rings movies were. So The Hobbit movie could easily do without Legolas. Another possible role for Bloom would be that of Thranduil, Legolas' father and king of Mirkwood. More rumors: the reputed wish list of New Line. Should both Sam Raimi and Peter Weir be not available, then New Line wants one of the following directors: Stephen Sommers, Michael Bay, Brad Silberling or Bill Condon. The validity of this report is quite questionable. The name of the director of 'Master and Commander' is now coming into play for the director job in The Hobbit movie. But it's not more than a rumor yet. Sam Raimi talks again about The Hobbit. 'The Children of Hurin' was released 3 days ago. Sam Raimi would make the Hobbit. But this would leave Spiderman 4 without a director. Some speculations on Entertainment Weekly. Q: You recently said Peter Jackson would never touch The Hobbit while you were at New Line. A:You know, we're being sued right now, so I can't comment on ongoing litigation. But I said some things publicly, and I'm sorry that I've lost a colleague and a friend. Q: Is The Hobbit still a viable project? A: I can only say we're going to do the best we can with it. I respect the fans a lot. Computer game delayed because of Hobbit movie? Game magazine Gameinformer reports in its April issue about Electronic Arts delaying the release of the game 'The White Council'. Interestingly, the timing of the original cancellation rumor comes suspiciously close to the news that movie studio New Line Cinema is planning a prequel movie preceding the events in the Fellowship of the Ring, as well as the Hobbit. Given that EA has a licensing agreement with the studio, it is possible that the planned content in the White council overlapped with the plans New Line has for its films. This may have caused the studio to step in and affect the game's development to suit its future plans. Bob Shaye won't be the director of The Hobbit, says Bob Shaye. At the end of an interview about the movie 'The Last Mimzy' Bob Shaye says, if New Line makes The Hobbit, they'll have a good director for it. MGM is putting money aside for The Hobbit. For this and other movies between 60 and 150 million dollars each are scheduled. The New York Times reports in an article on New Line founder Robert K. Shaye about his bad disease back in 2005 and about the current Hobbit timetable. Shaye, due to an infection, lay in a coma for six weeks in 2005. On The Hobbit, "he said, however, that although there was no workable script yet for the film, he intended to release it in 2009." 'The Children of Hurin' will be published mid April and can already be preordered. Not only Peter Jackson, but Peter S. Beagle too, the screenplay author of the 70's animated Lord of the Rings, still hopes for more money. Spider Man director Sam Raimi sayd, he is thinking about making The Hobbit. New Line still wants to have two Hobbit movies, and this without Peter Jackson. MGM in contrast still sticks to Jackson. Peter Jackson answered to the yesterday's accusations back. The Lord of the Rings movies never have been audited with him, New Line was 'completely uncooperative'. The quarrel between New Line and Peter Jackson continues. New Line Boss Robert Shaye will never again make a movie with Jackson. While Michael Martinez and Anne Petty campaign for a Hobbit movie, theonering.net addresses in an article fans and studios. Royd Tolkien, great grandson of J.R.R. Tolkien, votes in an open letter for Peter Jackson as director for The Hobbit. The book The Children of Hurin, which will be released in April 2007, is illustrated by Alan Lee. Here is a picture of the cover. Elijah Wood too is sad about Jackson's retreat. The interview with Saul Zaentz is already from the middle of October. And a decision who will be the director isn't made yet. So still nothing is decided. Gandalf-actor Ian McKellen is sad about Jackson's retreat and says that "we will have to await developments". MGM is angry about the latest fret over the director of The Hobbit (see last 2 notes) and says, Jackson is still in the run. Peter Jackson wrote in an email that he won't be the director of The Hobbit. According to his mail New Line is currently looking for another director, because Jackson won't do it before the lawsuit is settled and New Line has only a limited time option on the film rights. This is in direct contrast with the latest statement from Saul Zaentz. Things will stay exciting. Producer Saul Zaentz said in an interview with the German movie magazine 'Cinema', The Hobbit surely will be made by Peter Jackson. MGM-boss Harry Sloan meanwhile gives 2008 or 2009 as date. Q: What is with the long anticipated Hobbit-adaption? A: It will definitely be shot by Peter Jackson. The question is only when. He wants to shoot another movie first. Next year the Hobbit-rights will fall back to my company. I suppose that Peter will wait because he knows that he will make the best deal with us. And he is fed up with the studios: to get his profit share on the rings trilogy he had to sue New Line. With us in contrast he knows that he will be paid fairly and artistically supported without reservation. Howard Shore, composer of the soundtrack of Lord of the Rings, is looking forward to The Hobbit, too. He already talked with Peter Jackson about it. The first movie would be a direct adaptation of The Hobbit, and the second would be drawn from footnotes and source material connecting The Hobbit with The Lord of the Rings. The movie 'Halo', a project between Microsoft and Peter Jackson, has been put on hold. So Jackson would have more time to do The Hobbit now. MGM is in discussions with New Line Cinema to get the rights to produce two Hobbit movies. Between MGM and Peter Jackson's representatives initial conversations about The Hobbit have taken place. Yet it is questionable whether Jackson will start with The Hobbit soon. At least not while the lawsuit between New Line and Jackson isn't settled. Andy Serkis, actor of the later computer animated Gollum in The Lord of the Rings, hasn't been asked to paticipate in the Hobbit so far, too. Nonetheless he is looking forward to this movie. Video of the interview with Andy Serkis, after 3:28 minutes he talks about The Hobbit. Result of the 2 days survey: Should The Hobbit movie stay true to the book or should there be included other stories that are not part of the book (like e.g. the White Council)? Overall votes: 533. Multiple votes haven't been counted. In April 2007 a new and complete book by Tolkien will be published, the first since The Silmarillion in 1977! Christopher Tolkien now has reconstructed The Children of Hurin. Result of the 2 days survey: Should The Hobbit movie be made in one or in two parts? Overall votes: 416. Multiple votes haven't been counted. "I'd very much like Peter Jackson to consider it. I've put it to him a number of times. I think understandably his ambitions might lie elsewhere." In another interview Peter Jackson again talks about The Hobbit and says, the sets of Hobbiton and Rivendell do still exist and could be used in The Hobbit again. He still waits to be asked by MGM and New Line to produce The Hobbit. Meanwhile his calendar gets stuffed more and more with other projects. So maybe someone else will make the movie. Jackson would like to continue with the actors from Lord of the Rings and even include these roles which don't appear in The Hobbit or are only mentioned marginally, like Legolas and Saruman. With a movie in two parts he would show Saurons defeat against the White Council and his return to Mordor. The CEO of MGM has referred to The Hobbit as a high-profile project of the next years. Harry Sloan hopes to win Peter Jackson as director for one or two installments. Jackson in turn still hasn't been asked yet. A visitor of the New York Office of New Line saw 'The Hobbit' on the film schedule for July 2007. Rumors tell that at WETA the Hobbit movie is already in production. Ian McKellen told in an interview again that he would love to play Ganfalf in "The Hobbit". Q: If "The Hobbit," the prequel to "The Lord of the Rings," were made into a movie, would you want to play Gandalf again? MCKELLEN: I would love to do "The Hobbit," yes. Partly because I would hate to see anybody else playing Gandalf. The rune generator now finally works with all common browsers like Firefox and Opera and not only with Internet Explorer like before. Saul Zaentz, producer and one of the holders on the rights of the Hobbit movie expresses his optimism that the movie could be made soon. From the following article: "And fear not, lovers of furry-footed wee folk: Zaentz vows there will be a film version of The Hobbit, just as soon as the slightly more complicated legal entanglements around that property are ironed out." MGM, the owner of The Hobbit movie distribution rights, has changed its company politics. They are looking now for partners for the production of new movies. How this will affect The Hobbit movie is unclear, but we can hope.